Author List: Patrice Rey, Luke Mondy, Guillaume Duclaux, Christian Teyssier, Donna Whitney, Marie Bocher, cécile Prigent. Citation: Rey, Patrice & Mondy, L & Duclaux, G & Teyssier, Christian & Whitney, Donna & Bocher, Marie & Prigent, cécile. (2017). The origin of contractional structures in extensional gneiss domes. 45. 263-266. 10.1130/G38595. The juxtaposition of domains of shortening and extension at different scales in orogens has fueled many debates about driving forces and tectonic interpretations, including timing of deformation. At the orogen scale, gravitational collapse and mass transfer from orogenic plateaux to forelands explain some of these juxtapositions. At a regional scale, structures in gneiss domes are commonly contractional yet are coeval with regional extension and denudation. Here we use three-dimensional numerical experiments to show that crustal flow in orogenic domains does not necessarily conform to plate motion. We document contractional crustal flow associated with the formation of a gneiss dome in an orogenic pull-apart setting where localized extension and crustal thinning focus the exhumation of deep crust. We show that the flow field results in a complex strain pattern in which an extensional strain regime that is collinear with the direction of plate motion is partitioned into the shallow crust, whereas contractional structures and fabrics at a high angle to the direction of imposed transport develop in the deep crust. 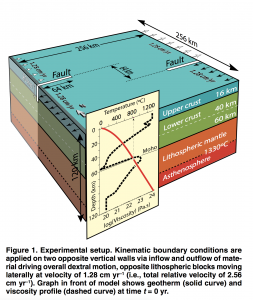 Advective mass transfer across regions of contrasting yet coeval strain regimes leads to a polyphase tectonic history. We observe structural features remarkably similar to those documented in some natural gneiss domes such as the Montagne Noire, which developed in a dextral pull-apart domain at the southern margin of the French Massif Central.